On TRILLogy, Scare Don’t Fear has redefined trap metal, which, according to Urban Dictionary, is described as ‘a southern dirty third combination of both rap and rock that was created in New Orleans.’ Well, this isn’t that. It’s not rap metal, it’s not rap rock, it’s not crunkcore, it’s not rapcore; it sounds closer to something you might hear on Psychopathic Records. Rapper Chris Jungles shines on the opening “The Anti,” spitting his immense game over top of a sumptuous bed of electronic-fueled noise courtesy of beatmaker Larry Ohh, though his rhymes and lines are even more monstrous on the following “Let Out The Beast,” a track that sees screamer Frankie Screamz do his thing, and do it very well as he screams “Who let out the beast?”; the closing “Reckless” is where everything comes together to work in harmony - punishing guitars, crushing drums, fiery verses and anthemic hooks. 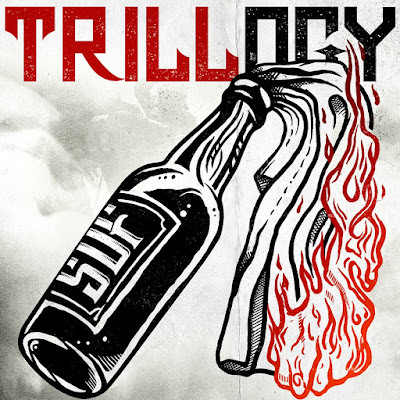 Unfortunately TRILLogy is only three tracks, but that’s what makes it entirely digestible and ultimately hella fun, and ripe for multiple listens.